Definition: The Corporate Restructuring is the process of making changes in the composition of a firm’s one or more business portfolios in order to have a more profitable enterprise. Simply, reorganizing the structure of the organization to fetch more profits from its operations or is best suited to the present situation. Financial Restructuring: The Financial Restructuring may take place due to a drastic fall in the sales because of the adverse economic conditions. Here, the firm may change the equity pattern, cross-holding pattern, debt-servicing schedule and the equity holdings. All this is done to sustain the profitability of the firm and sustain in the market. Generally, the financial or legal advisors are hired to assist the firms in the negotiations. Organizational Restructuring: The Organizational Restructuring means changing the structure of an organization, such as reducing the hierarchical levels, downsizing the employees, redesigning the job positions and changing the reporting relationships. This is done to cut the cost and pay off the outstanding debt to continue with the business operations in some manner. 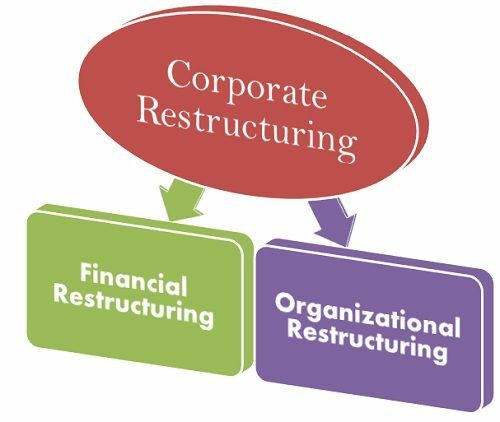 The need for a corporate restructuring arises because of the change in company’s ownership structure due to a merger or takeover, adverse economic conditions, adverse changes in business such as bankruptcy or buyouts, over employed personnel, lack of integration between the divisions, etc.